Will TFN Stand Up for Science? Probably not. Next Tuesday (Sep. 17, 2013), the Texas State Board of Education will hear public testimony regarding new textbooks for Texas’ state-run schools. Unfortunately for some, promoting quality science materials for all children will take a back seat to TFN-sponsored anti-creationism and global warming hysteria. 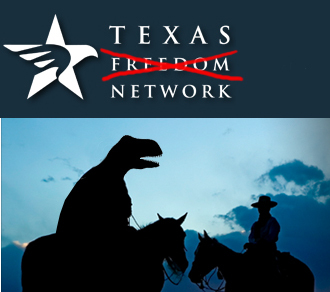 TFN will lead the charge, with yet another irrational dinosaur history protest scheduled for noon outside the William B. Travis building in Austin, TX. Many people do not know that a basic principle of the scientific method is repeatability. If you can verify a claim through repeated experimentation, then it is a scientific claim. But think about the “battles”. The creation/evolution battle is not over scientifically verifiable claims, it is a battle over how to interpret unrecorded history. The last time I checked, most thinking people define the study of the past as history, not science! People have different interpretations of the past, but so what? Why do we need to protest that? Can’t we just discuss it? All indications are that TFN and their allies are not interested in standing up for science, they are interested in defending their dogmatic interpretation of history, at all costs. How irrational and misleading! And think about global warming hysteria. Meteorologists can still barely produce a decent 10-day weather forecast, yet many have been suckered into “believing” long-term climate models that are not easily verifiable. Global warming hysteria is really fueled more by “futurology” than anything scientific. Fortunately, now that the hysteria has been around for a while, we have real observations to compare to speculative models. The verdict is in: the models overwhelmingly predicted higher-than-actual temperatures over the last 30 years. But what about testable repeatable science? What about the study of epigenetics, a field that is revolutionizing all of the biological sciences? If you think of the genome (set of all your DNA) as the “ship”, it doesn’t do anything without a captain. And what is the “captain”? It’s the epigenome, a separate set of information stored in a variety of forms inside cells. Epigenetics has implications for everything from cancer to the effects of diet on human health. Recently, I reviewed some of the Texas biology textbooks up for adoption. Amazingly, not one of the textbooks I reviewed contained information on epigenetics! In 2011, when I reviewed online materials for Texas schools, I had to go against my entire review team just to get one lousy paragraph on the epigenome into the curriculum! Why the disregard for teaching 21st Century Science? Well, it doesn’t come from scientists, but from dinosaur history protesters. You see, epigenetics has been proposed as “an outright counterpoint to purely Mendelian inheritance” and as “the study of heritable changes in cellular phenotype, or gene expression that is initiated by factors other than changes in the DNA sequence.” (from The Epigenetic Landsape, an article in the Spring 2012 issue of In Vivo, published by the University of Texas Department of Biological Sciences). For close-minded Darwinists, “change” comes from DNA mutations alone, which is why epigenetics “raises hackles” for the irrational, unscientific horde. Will 21st Century science be suppressed in Texas textbooks? Time will tell. All scientists would agree that 21st Century biology students should learn about epigenetics. But what about political activists, shouldn’t they agree, too? Yesterday, I called and emailed Texas Freedom Network (TFN), asking them to support teaching epigenetics in Texas textbooks. I have not heard back from them, and am not too optimistic that I will. I think they would rather spend time photoshopping dinosaurs riding horseback than pushing for better math and science education in Texas. Pray for TFN and their allies, that they would see their folly and turn from it. Pray that they would repent and promote liberty through Christ alone, the Author of all knowledge, and the #1 Advocate of good education for all children! Creationism hysteria has struck again, and this time the attack is targeted at homeschoolers. A two-hour YouTube video titled “Home School abuse by Creationists“, shows a recorded Google Hangout of several atheists huffing, whining, head-shaking, and hand-waving over the fact that Christians like me believe Scripture gives an accurate account of history. The atheists are particularly in a kerfuffle over Ken Ham, to the point they are organizing a “protest” at the THSC Home School Convention, August 1-3, 2013, in The Woodlands, TX, where Mr. Ham is speaking. They are also considering protesting the CHEA Home School Convention, June 6-8, 2013, in Anaheim, CA, where Mr. Ham is a keynote speaker. Some of the women in the video homeschool their own children, and they make some good points about problems with government education, and how other atheists shouldn’t chastise them for wanting to give their children a better education than government schools can. Unfortunately, when it comes to understanding science, or its language, mathematics, these atheists seemed woefully unprepared to give their children anything remotely resembling a proper science and math education. Without fail, hysterical anti-creationists muddle the distinction between a scientific thing and a historic thing. Over and over in this 2-hour video, complaints were made about Christian homeschoolers teaching their kids the “scientific claim” that dinosaurs and humans lived at the same time in the past. But this is an interpretation of history, not a testable, repeatable scientific claim! Natural history research is about interpretation of past events, and scientific research is about verifying hypotheses through experiments others can repeat. Scientific research does not need a time machine to verify its conclusions. At about the 39-minute mark in the video, Shayrah mentioned that this is a “great big war”, and it is “not being handled properly”. Well, that is exactly right! Atheists and Christians alike often foolishly conflate natural history research and scientific research. The creation/evolution battle is a battle over natural history claims, not scientifically testable claims, and the battle is nothing new. It’s an insatiable demand for more evidence, which you will never get enough of. In the film How to Answer the Fool, Sye Ten Bruggencate describes this as an “infinite regress”. So atheist, if you seriously want to advance learning, then don’t waste your time protesting how some Christian homeschoolers interpret history, while simultaneously demanding more and more evidence! Faith is the evidence of things not seen (Hebrews 11:2), so have faith(or not) in the evidence from Scripture and nature regarding the past that we cannot see. Then, get beyond your creationism hysteria and get out there and discover some new disease cures, or design a more efficient automobile motor, etc. At about the 36-minute mark, Lilandra proclaimed that “teaching the earth is 6,000 years old is not science”. Correct again! Teaching ANYTHING about earth history is not scientific teaching. It happened in the past, which is why we call it HISTORY. Natural history research certainly involves the use of scientific instruments, but it is ultimately a historic endeavor, not a scientific one. If atheists like Shayrah, Lilandra, and her husband AronRa are serious about defusing this “great big war”, then they will make a giant intellectual leap forward and start properly discerning between a scientific thing and a historic thing. Battles over earth age and origins will always be with us, because we don’t have time machines to go back and determine exactly how it all went down. Old earth or young earth, common descent or uncommon descent, we all have the same evidence. The differences come when we try to interpret the evidence. A true freethinker (which is usually the Christian, not the atheist) will teach their child about all the evidence about our past, and let them decide which interpretation they think is the best one. And if the child ends up believing God’s story about history, and trusting Christ as their Savior, what does that matter to the free-thinking atheist? If it matters in the slightest, then they are not true free-thinkers, but rather atheists with an agenda. Why are hysterical a-theists also a-math and a-science? Another big disappointment in this video was the lack of any real discussion about teaching children real science and its language, mathematics. There was some discussion about scientific illiteracy, but the discussions almost always reverted back to hysteria over how to interpret natural history. For example, at about the 1 hour, 27 minute mark, Shayrah made the illogical connection that if you believe man and dinosaurs lived together, then you can’t advance the study of disease cures! Whatever. What is logical though is this: if your child has poor math skills, it will be much more difficult to understand 21st Century science, including finding disease cures. Calculus in particular is probably one of the most important tools for students to learn. Understanding calculus opens a student up to take courses in every department on a college campus. Not knowing calculus shuts them out of most science and engineering degrees. Not surprisingly though, calculus was not mentioned once in this two-hour atheist history rant. To the detriment of society, most atheists are totally focused on the wrong thing. They say they want more scientific literacy, but they go about it by getting hysterical about, of all things, Christian homeschoolers! Actually, if the atheists in this video were more scientifically literate, they probably wouldn’t be so hysterical about Christian homeschoolers’ beliefs about history. Second causes have a first cause. First causes have no cause. God is THE first cause. Therefore, God is without cause. It is logical to conclude that God is without cause. What is illogical though, is to assume that nothing created everything. If, in the above syllogism, you substitute “nothing” for “God”, then the conclusion is that “nothing has no cause”. In other words, not one single thing is without cause. Everything has a cause! Except God. So, the atheist is left to teach their child the illogical claim that nothing caused all the atoms, the light, the energy, time, etc. There was no cause for all the trees, fishes, birds, and there was no cause, and therefore no purpose, for the atheist or their children. Of course, no atheist acts like this, so their idea (atheism) doesn’t match their reality. Since the atheist must believe in a life without cause or purpose, they must borrow from Christianity to do anything, including science. The Christian understands that it is the glory of God to conceal a matter, and the glory of kings to search a matter out (Proverbs 25:2). Created in His image, both male and female (Genesis 1:27), human “kings” are therefore creative, too, and designed with the ability to discover the plan and purpose God put into everything He made. Scientific investigation is about making observations and discovering the pattern, purpose, and predictability of things. Science is about understanding what “is”, not about interpreting what “was”, and then getting hysterical when others disagree with your interpretation of what “was”. Doing science is about finding out how the world works, which is actually one of the first commands God gave humans in Genesis 1:28. He told us to take dominion, which the wise Christian interprets as being a good steward of what He made. Scientific investigation is founded in biblical Christian thinking about the world, not atheistic thinking. To the atheist considering protesting either the THSC or CHEA conference, I urge you to not stand outside picketing, but come inside and learn! Come with a truly freethinking attitude, and get along with people you disagree with regarding earth history. But join us in our pursuit to build scientific knowledge, and set your standards for math and science education higher than the government schools do. To anyone considering homeschooling or currently homeschooling, check out my company’s catalog to learn more, or stop by my booth at either the CA or TX conference. I would be happy to discuss science, math, and natural history with you! My math and science courses are for all homeschoolers, including the tolerant, freethinking atheist! Whatever you do, don’t come to protest Christian interpretations of earth history. That puts the focus on the wrong thing, and makes you look like a scientifically-illiterate fool. Go after math and science knowledge for you and your children instead, but remember this: you can be incredibly smart, understanding all mysteries and all knowledge, but if you have no love for your fellow man, God considers you as nothing (I Corinthians 13:2). Thanks for reading this! Here’s a video I made about a typical day at my homeschool co-op science classes. I hope this video will encourage others to start a homeschool co-op in their town. I hope too that it will help skeptics see that Christians are not “anti-science”. And we aren’t against having fun while we do science either! Is the NCSE good for the world? A name like the National Center for Science Education (NCSE) gives the impression of an organization with a vision for improving science education. If NCSE were good for the world, it would be a clearinghouse of information for helping science educators stay updated on the latest advances in science, which they could pass on to students. It would cover all the sciences, and give helpful tips on science fundamentals such as the scientific method and the limitations of this inductive approach to studying our world. And of course it would focus heavily on mathematics, the language of science, with helpful resources to improve mathematics teaching. It would also have a special mission for helping the worst-performing schools, providing hope and encouragement to educators and students to study and apply science in ways that will help them be more productive for the glory of God and the service of others. Unfortunately, the NCSE is none of these things. In fact, their mission is simply this: defending the teaching of evolution in public schools. Instead of being our national cheerleaders for advancing real science education, the NCSE instead is only about defending a single, faith-based natural history topic known as evolutionism. They confuse natural history with science, which in turn confuses others into thinking that science can answer all questions about the past. The reality is that natural history is a mixed question, and it requires inputs from other areas, such as historical documents like Scripture. Unlike normal scientific research, whose conclusions can be verified, conclusions made from natural history research cannot be verified. Treating origins topics as history instead of science causes people to realize that we all have the same evidence, the differences come in the interpretations, and some interpretations are definitely better than others. It also helps people realize that the creationism vs. evolutionism battle is not primarily a religion vs. science battle, but a battle of one religious belief vs. another. Many individuals, including those at NCSE, confuse the boundary between real science and natural history research. So, the NCSE is not about promoting science, but evolutionism. Evolutionism is the faith-based idea that somehow, through a very long series of genetic copying errors, bacteria turned into people. And thanks in part to the NCSE’s dogmatic approach to education, this idea is the only major premise used in most biology curricula on the market today. Fortunately, not everyone believes the unverifiable claims of evolutionists. The more we learn about cells, the more improbable evolutionism sounds. But the NCSE marches on, blind to the advances in 21st Century science, because real science naturally opposes their mission. And if you still don’t believe that the NCSE would choose evolutionism over testable, repeatable science, please, read on. From June 13-17, 2011, I was able to participate on a Texas review panel for adopting new high school biology curricula in public schools. This process is designed to allow public participation in the review process, and State Board of Education members are allowed to appoint members of the public to a week-long review process. I was nominated by my State Board Representative, Mrs. Barbara Cargill. Texas adopted new high school biology teaching standards in 2009, and the review panels analyzed and evaluated the new supplemental science curricula to determine if the standards were being met. We also checked for factual errors, but that’s another story. One of the new standards approved in 2009 is called TEK 7G (TEKS = Texas Essential Knowledge and Skills), which required students to “analyze and evaluate scientific explanations regarding the complexity of the cell.” I thought publishers would jump on this opportunity to teach high school students about 21st Century research involving cell complexity, but I was sadly disappointed. I was also disappointed with the poor quality of some of the curricula, but a curriculum we reviewed by Holt-McDougal was better than most. Unfortunately, the presentation of TEK 7G was extremely weak, and consisted of an evolutionary explanation called endosymbiosis. Endosymbiosis, the turning of a prokaryote into a eukaryote (cell with a nucleus), has never been tested. It is an idea about cells eating other cells, and instead of becoming dinner, the consumed cells turn into highly specialized and purposeful cell organelles. Kind of like if you ate a hamburger, and, instead of being digested, it turned into a dolphin. Or something like that. The review panels consisted of teams of 3-4 people, and I actually had to go against my other team members and reject Holt’s weak effort to address TEK 7G. One excuse a team member gave for approving it as-is was that what I had proposed would be “too hard” for students to learn! But a mark of a good educator is finding simple ways to explain complex concepts. Fortunately, the only way for Holt’s weak attempt at addressing TEK 7G to gain approval was if our review panel voted unanimously in favor of it. So I rejected it, and you can read my reasons and suggestions here. I was pleasantly surprised when Holt accepted many of my suggestions. They could have disputed all of my suggestions, as they did with several factual errors our team presented, but they didn’t. So now, besides endosymbiosis, students who use the Holt curriculum can also learn about 21st century science concepts like genomes, proteomes, and interactomes. Holt added a beautiful section titled 21st Century Cell Complexity, and presented it simply and clearly. And as I had hoped, they also directed teachers to the National Center for Dynamic Interactome Research, where, if you look, you can find an easy-to-understand laboratory activity that uses cell phones to explain interactomes. While public school biology curricula have a long way to go, the ones from Texas are definitely better than ever at presenting students with alternatives to evolutionism. After Holt made some, but not all of the changes I had hoped for (I wanted them to include a “tree of life” that had multiple “trunks”), the changes still needed to be approved by the State Board of Education. Thankfully, they were adopted on July 20-21, 2011. Not surprisingly, the NCSE sent someone to promote censorship of the self-evident truth that living organisms were designed. Programs and Policy Director Josh Rosenau testified, and I later had the opportunity to meet him. In our brief but friendly conversation, I asked him what he would do if he had to choose between teaching endosymbiosis or teaching 21st century science on cell complexity. Without hesitation, Josh said he would have to go with the non-scientific idea of endosymbiosis! Oh well, at least Texas public school students will have a choice now on what to believe. Are cells specially created, multi-dimensional super machines and is there evidence to support this, or are they cannibalistic bags of salt? I’ll choose the former, what about you? And that is just one of many reasons NCSE is not good for the world. Now they have a new documentary out that is the closest thing I have seen to white elitism in a long time. Like, since Hitler. Or Sanger. You have to watch the trailer, and see if you notice a seemingly white elitist message proclaiming that portly, toothless, dark-skinned people with thick accents are the only ones who would consider teaching about alternatives to evolutionism. Immediately following the non-white man, a white woman explains how people who don’t believe in evolutionism are like people with severe handicaps. It could just be bad filmmaking, but the disrespectful, white-elitist message seems pretty clear to me. But then again I’m not sure if I would expect much different from people who have so much faith in Darwin, who based his ideas on Thomas Malthus’ 1800’s human population myths. And it was Malthus who proposed moving poor people to disease infested swamps so that they would be more likely to die, and this would keep their population in check! sometimes called Solomon’s House, and sometimes the College of the Six Days’ Works, whereby I am satisfied that our excellent King had learned from the Hebrews that God had created the world and all that therein is within six days: and therefore he instituted that house, for the finding out of the true nature of all things, whereby God might have the more glory in the workmanship of them, and men the more fruit in their use of them, did give it also that second name. Wow, a National Center for Science Education like that really would be good for the world!